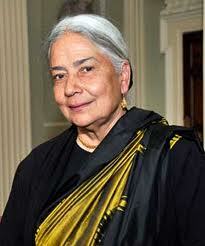 Suprose is excited to announce that Anita Desai is among the five 2012 PEN/Faulkner award finalists for her latest collection of three novellas The Artist Of Disappearance. Five books of fiction published in 2011—Anita Desai’s The Artist of Disappearance, Russell Banks’s Lost Memory of Skin, Don DeLillo’s The Angel Esmeralda: Nine Stories, Julie Otsuka’s The Buddha in the Attic, and Steven Millhauser’s We Others: New and Selected Stories—have been nominated as finalists for the 2012 PEN/Faulkner Award. Four of the nominees will receive $5,000 and the winner, to be announced on March 26, 2012, will receive $15,000. Judges Marita Golden, Maureen Howard, and Steve Yarbrough selected the five finalists from a pool of nearly 350 novels and short story collections published by American writers in the U.S.
“The PEN/Faulkner judges have chosen an impressive list of books from those published in 2011, exciting in the range of stories selected, their integrity and excellence,” said Susan Richards Shreve, Co-Chairman of the PEN/Faulkner Board of Directors. All five authors will be honored at an award ceremony at the Folger Shakespeare Library in Washington, D.C. on May 5, 2012. If interested in attending, visithttp://www.penfaulkner. org to purchase tickets.